Another bombshell. This time, the church will really sit up and take notice! But for some reason, I didn’t react to the latest Driscoll reveal the way I’ve reacted to others like it in the past. It’s not that I don’t care, that I don’t hurt for all involved or that I don’t feel outrage or disgust. I do, on all counts. I hope everyone will understand the spirit in which I am writing this post. I’m writing as a person who has had much of her life turned upside down since the day Tyndale House approached me last fall and asked, “Do you want to interview Mark Driscoll about his new book, ‘A Call to Resurgence?’” Frankly, I didn’t want to interview him at all. I’d turned down two previous opportunities to interview him, because the little I knew about him at the time was more than enough for me to think — as a Christian — that I didn’t want to promote anything he did, ever. The “cussing pastor?” No, thanks. That was a lie, of course. And he shouldn’t have crashed another pastor’s conference, because that’s rude. I wanted to ask him why he was rude and why he lied. Then I read the book and found that Driscoll had plagiarized 14 pages of my good friend Peter Jones’ material. Material that Dr. Jones wrote after much scholarly study and hard work and strenuous thought. Material that Driscoll had no right to steal and pass off as his own. So, I asked Driscoll about it. And he was defensive and dodged questions and put me down and responded pretty much the way I anticipated he would respond. But I can live with that, I thought. Because I was just naive enough to think people would grasp the bigger point: that Driscoll plagiarized, and that that is a huge, massive, embarrassing scandal. Everyone knows plagiarism is a horribly unethical thing to do, I thought, and the church will be outraged! Plagiarism ends careers in academia and in journalism; how could Christians ever tolerate it from a pastor, who should live by the highest of standards? Plus, Driscoll has publicly condemned plagiarism himself! So Christians will no doubt listen to this information, be horrified, and then his publisher will dump him, and his church will probably ask him to step down. Right? Because true Christians have top-notch ethics and morals, right? We wouldn’t dare allow a pastor who’s done this to get away with it. Right? That was not exactly how it turned out. His publisher backed him — and its employees publicly and privately attacked me. 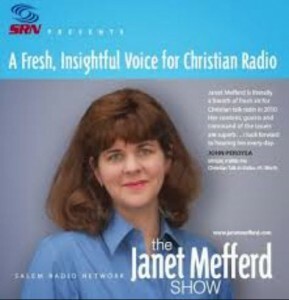 One of his buddies from The Gospel Coalition, Crossway’s publisher of books Justin Taylor, tweeted out that he “wouldn’t recommend authors go on Janet Mefferd’s show after she pulled this during an interview with Pastor Mark.” Taylor went on to spread further lies about me on the Internet and wouldn’t retract them. I got hate mail by the boatload. I couldn’t keep up with the number of inaccurate and untrue stories about me online; I had to give up. Christians who should have stood with me publicly were nowhere to be found, with some intentionally jumping ship. The reverberations went on and on. He waited a month, issued a “mistakes were made” media statement, and continued on as if none of it had happened. That wasn’t the end, of course. Over the last nine months, there were endless Driscoll scandals that followed: There was more plagiarism to be revealed (at last count, nine books’ worth, along with sermon material), the ResultSource scandal, the accusations of verbal and spiritual abuse against his Mars Hill family, the vulgar William Wallace II rant, the church protests, the staff and board resignations, the ousting of Driscoll and Mars Hill from his Acts29 church-planting network and several conferences, the charges brought by former Pastor Dave Kraft, the charges formally brought against Driscoll by 21 former Mars Hill pastors. Sure, there were a few more pseudo-apologies from Driscoll, which were never real instances of godly sorrow and thorough repentance, but the Internet would be awash in cries for mercy: “Seeee? It’s time to heeeal and restoooore Mark Driscoll!” Then another scandal would break, and we’d go through the same cycle, AGAIN, ad nauseam. Driscoll offered his last public mea culpa lite last Sunday (with some help from his newly hired PR firm, of course), and he announced he’d step away for a minimum of six weeks as his hand-picked Board of Advisors and Accountability reviews the charges against him — tantamount to a defendant picking his own jury. So, the bottom line? See you in six weeks, Pastor Mark! Have fun during your time off, and get some rest so you can make your triumphant return! No surprise, then, that another bombshell followed today, when I received the letter from the nine pastors. More deceit, more evidence, more bombshell quotes, more, more, more. And at this point, I decided, I just feel … done. Why is this endless cycle necessary? I’m all for grace and forgiveness, but let’s not be foolish here. 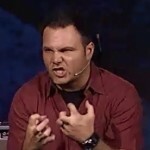 Mark Driscoll shouldn’t be a pastor. And we didn’t need all these scandals from the last nine months to figure that out. Because the truth is that any intelligent Christian with the ability to read and understand the Bible could have and should have discerned who this man was years ago and abandoned ship. Pick your moment of revelation: Should it have been when Mark Driscoll claimed that God called him to be a pastor in a “weird charismatic moment?” How about when Donald Miller dubbed him “the cussing pastor?” Or maybe when he started having “pornovisions” or angrily screamed, “How dare you? Who the (blank) do you think you are?” at his church members? How about when he referenced the “pile of dead bodies behind the Mars Hill bus” that would result from people not getting on board with his “vision?” The pile that “by God’s grace … will be a mountain by the time we’re done?” Or the Elephant Room 2 debacle — might that have been a good time to abandon support for Pastor Mark and his cult of personality? I simply don’t get it. Why didn’t the entire membership of Mars Hill get up and head for the exits at any of those points? Why didn’t his Christian fans unfollow him on social media, stop reading him, stop watching him and stop listening to him? More significantly: Why didn’t any of Driscoll’s Big Name enablers — and you know who you are — look past his doctrinal statement to the man’s obvious character, ponder I Timothy 3 for a nanosecond, and think, “Hmm. Something’s off here?” And assuming some of them did have that thought at some point, why didn’t they get up and head for the exits before recommending this man to anybody in the church at large? And why didn’t any of them stand up months ago and apologize to the church for previously endorsing this man? Why didn’t the Christian publishing world, the Christian big names, the Mars Hill membership and the church at large head for the church/social media/conference exits when they found out Mark Driscoll plagiarized a number of his books? Was that just … all right with you guys? Why have so many Christians — in so many different pockets of the church, for so long — defended him, enabled him, oozed gushy love statements about him and continued to prop him up, against all evidence, against clear biblical admonitions and against all common sense? Some did it, I am sure, because they value money more than ethics. Some did it because they value coolness more than godliness. Some did it because they value being part of the Evangelical Club more than being godly men. Some probably were clueless. And some just value celebrity over everything. But I think the real reason it’s happened is because much of the church today has just stopped caring what the Lord thinks. We know He is holy and that He admonishes us to pursue godliness, as new creatures in Jesus Christ. We know that. We know He doesn’t approve of lying, stealing, hypocrisy, cussing, fraud or spiritual abuse. Not just “doesn’t approve.” The Lord hates it. It’s sin. We also know that the ministry is supposed to be a high and holy calling. The Bible is crystal clear about the qualifications for ministers of the gospel, and they’re sobering to consider. Read I Timothy 3. Read Titus 1. Read I Corinthians 5. Do you believe those verses there? Given what he’s done, do you believe Mark Driscoll is “above reproach?” That he has a “good reputation with those outside the church?” That the church should tolerate an ungodly, unrepentant pastor? Would any of us tolerate this sort of behavior in a pastor of a 100-member church? If not, why the different standard for Driscoll? Is he above the Bible? If not, why is he still in the ministry? You know why, and so do I. Because he’s famous and has a big audience. And after all, the show must go on, baby! 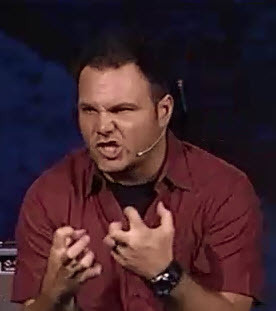 I firmly believe Mark Driscoll will not leave Mars Hill Church. He regards it as his crowning achievement (unbiblical ecclesiology notwithstanding). He’s dug in, he’s resisted all calls to true repentance, he’s stacked the deck, he’s hired the PR firm. And he’s counting on a core group of ignorant non-discerners and celebrity-worshipers to keep him going and help him rise from the ashes of scandal. He’ll probably get it, too. That’s why, Mars Hill friends, I am appealing now to you. Those of you who are true Christians, who understand the Word of God, who love the Lord Jesus, who have kept hoping in vain for change at the top for so long — it’s now your move. Everything you ever needed to know about Mark Driscoll that would help you make a decision about how to think about him and his ministry is patently obvious and exhaustively documented. You don’t need one more bombshell letter or insider document to tell you what you already know. You don’t need me or anyone else to expose anything more about this man. You know who he is. You know how he’s reacted. And I assume you know what the Lord thinks about the high calling of the ministry. If your disqualified pastor won’t hit the exits, then you need to do it. And if you decide not to hit the exits, then you’ll have to accept the consequences. Because while I have cared deeply about telling the truth regarding this story and about standing with those who have been hurt, there is nothing left to say anymore. It’s all been said. So that is why I have to say, “I’m done.” And that’s why I am praying that, by God’s grace, so are you.